Disclaimer: This post contains affiliate links. All thoughts and opinions are my own! Since Valentine’s Day is tomorrow I thought it was only appropriate to share something that Kevin and I both did recently. 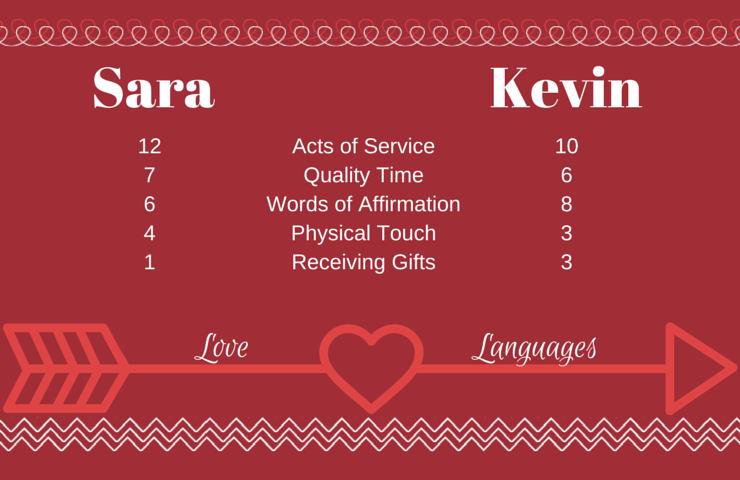 We retook the Five Love Languages quiz! We actually did this for the first time back when we were going through our pre-marriage counseling. Honestly I don’t even remember what our results were then! But we’ve lasted for almost eight years already so something must be working! Our engagement photo from Feb 2007. Anyways, I came across the Five Love Languages website the other day on Pinterest and decided to take the quiz again to see what it said about me. I was not at all surprised by my results. Kevin’s comment when he saw them was, “But I’m so good at giving gifts!” Haha, sorry hubby! Looks like folding the laundry and doing the dishes means more to me than flowers or jewelry! You can see that “Acts of Service” ranked the highest for me by quite a bit. Followed by “Quality Time”, “Words of Affirmation”, “Physical Touch”, and “Receiving Gifts”. I got Kevin to take the (short-20 question) quiz that night too and his results were surprisingly similar to mine. Well, I was surprised, he said he wasn’t. After you take the quiz it give you a nice little print out of your results and also has descriptions of each of the categories. Kevin made the comment earlier today that he still had one more day to get me something for Valentine’s Day. I decided to let him off the hook and reminded him that “Receiving Gifts” was the lowest of my Love Languages! So we’ll see if he decides to do the laundry for me or make me dinner tomorrow night. Maybe I can make the dinner and he can clean up! Then we will both win! Below is an Amazon link to some of the Love Language books. There’s the one for couple, but there are also specific ones for husbands, kids, and teenagers. I’m going to read the kid book next to see what my boys’ love languages are. I know they will be complete opposites! I’ll let you know the results when I get them! Are you doing anything special for Valentine’s Day? We’ve gone out in the past, but lately it’s just easier (and cheaper!) to stay home and make a nice dinner to enjoy as a family on Valentine’s Day. Also, what is your Love Language? Happy Valentine’s Day tomorrow!